Modern Mormon Men: Don't Edit Me, Bro! 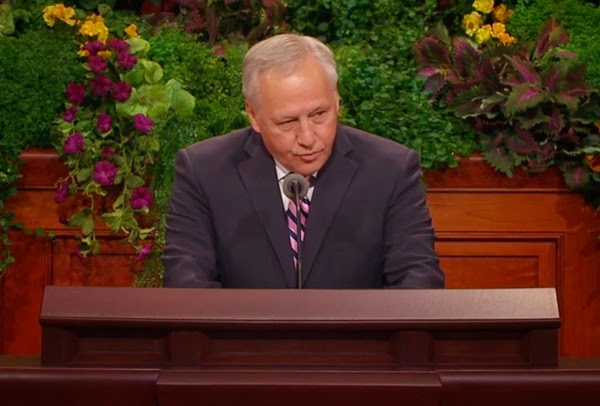 If President Uchtdorf's words weren't enough, they were further backed up by Elder Bruce A. Carlson's opening prayer for the Priesthood Session, in which he gives thanks for this "fourth session." The Priesthood Session would be the fourth session if you are counting the Women's Session as the first. #math. You can hear his prayer here, starting at the 5:00 minute mark. Go have a listen, I'll be right here when you get back. Wait. What do you mean you didn't hear him say "fourth session"?? Oh. That's right. The video on lds.org has been edited and the word "fourth" has been removed. So. Why edit it? Why try to change something after its already been said. Publicly. In front of a pretty big audience. Some might think "who cares?" What's the big deal if they edited out one little word in one prayer from the entire weekend? Who cares if the Women's Session is actually a session of General Conference or if it's a separate meeting that just so happens to come around during the same time as the rest of conference? It matters because at best, it's a case of a video production editor gone wild. A rouge employee who couldn't stand the thought of including the women's session as part of the larger conference, and using his skills as the president of Provo High's Audio Visual Club, he lashed out the only way he knew how. Or, at worst, it's the Church's way of completely bungling its approach to building better relationships with women. Perhaps there was not consent among church leadership about whether or not the Women's Session was an actual General Conference session, and that President Uchtdorf's words were met with the smacking of foreheads by other General Authorities backstage. This isn't the first time the Church has been caught using their editing tricks. Just ask those angels in that painting how they liked having their wings photoshopped out and modest sleeves photoshopped in. The point is, and the plea I'd like to make to the Church, is this: just be real with us. If you're really not ready to call the Women's Session an actual session of General Conference, then just say so. Let a speaker say what they want, and either correct them from the podium, or send out a nice press release clarifying your position. After all, whether it be by the mouth of God's prophets or His PR department, it is the same. Right? But please, don't edit things out after the fact. Don't try to sweep things under the rug with the hopes that we won't notice. Because we do notice, and these small things do matter. They matter to the women who rejoiced at the idea of their meetings being equally important to not only the Priesthood, but the other sessions of General Conference as well. They matter to the trust of your members who feel hurt by the not so pleasant confrontations you've had with women in recent months. And they matter to fathers like me, who are trying to raise their daughter in a tradition that can be difficult, from time-to-time, to tell if she really will be valued for anything beyond her carefully crafted gender role. So please. Just be real with us. We can take it.